Putzer's page?? What the heck is a putzer?? 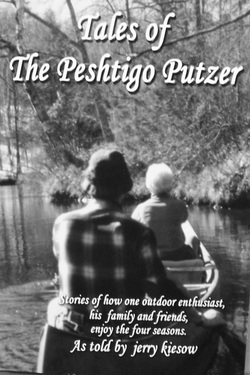 To quote from my book, Tales of The Peshtigo Putzer : "A putzer is one who does many things - a little bit of this, a little bit of that - most of the time he has a little bit of this and that going on at the same time. A putzer is not an expert, but rather someone who gets by very nicely for his own purposes, and above all has learned how to enjoy at least a little bit of every day, and tries to live each day fully. A description that our subject's better half says,'... is what he does best - putz!' "
Now that you know what a putzer is, I'd like to share one of his experiences via a recent "tale". The sampling is from my column in The News Graphic, a local Ozaukee County newspaper, Outdoors with Mr. P.
Check it out below. I will be changing them from time to time, so better read them while they are still here. If you enjoy what you read, and would like a copy of the book, it is available on line at americastarbooks.com, Amazon, and others. OR, if you would like a personalized, autographed copy, email me at mrmrsprg8@wi.rr.com. My cost to you is $20.00 if I can hand the book to you, directly. (Price includes sales tax.) If I have to ship the book to you, please add $5.00 - ($25.00). (It makes a great gift!). Note: This is now a collector's item. It is no longer in print. I have a few, so if you want one, contact me.